Another week, another edition of NFL’s Thursday Night Color Rush game. 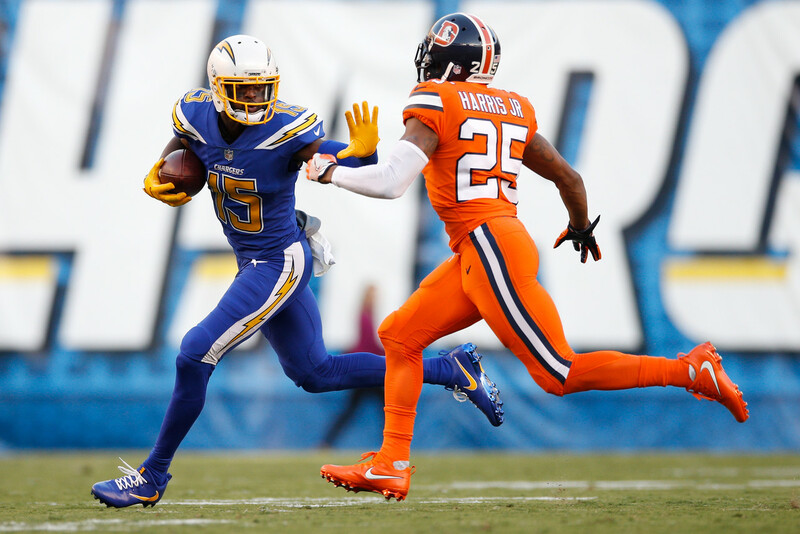 This past week produced the most colorful matchup to date, with the Broncos wearing orange and the Chargers wearing navy blue. What set this matchup aside from previous ones was that both teams had their uniforms designed to resemble uniforms they wore in decades past. Let’s take a closer look. The NFL has a strict policy on players wearing one helmet shell per season to try and prevent concussions, so both teams utilized their existing helmets with some changes that will remind veteran fans of decades past. The Broncos replaced their current side profile logo with the old Denver D and a helmet stripe down the middle, which will remind any fan of their ‘80s lids. Their jerseys and pants both trade out navy blue for royal blue and revert back to block numbering, very reminiscent of their old uniform. The Chargers replaced their navy facemask with a yellow one and replaced their navy blue color with royal blue. Both moves pay tribute their late ‘70s and early ‘80s look. You could say the white helmet pays tribute to their ‘70s look as well, but since they already wear a white helmet it’s a current design. For anyone looking for a bit of nostalgia, this Color Rush game certainly had it. 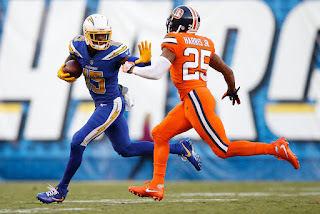 If you’re like us, you think both of these teams should revert their uniforms back to what they wore in decades past, but after a few lackluster weeks of Color Rush uniforms, it was definitely nice to see a color-on-color game. Next week puts the navy blue-clad Bears up against the all-white Packers. What do you think of this week’s uniforms? Let us know in the comments below! The last few Color Rush games have been pretty tame (but did you see the Dolphins in bright orange?) 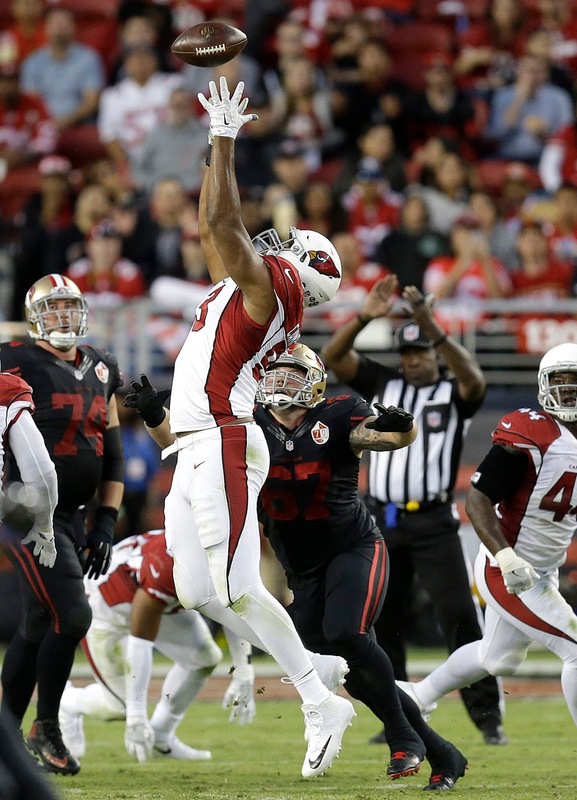 so we haven’t given our thoughts on the monochrome Thursday night games since they first started, but we’re back this week to talk a bit about the Cardinals and the 49ers in last night’s Color Rush game. The matchup featured the Cardinals in a monochrome white uniform and the 49ers in a monochrome black uniform. You can argue the Cardinals were wearing their standard uniform which doesn’t make for much of a “special” design for the Color Rush games. The one change they had from their standard design was solid white socks. The 49ers, on the other hand, took the black to the max. You may remember them trotting out in black uniforms before, and your opinion of them probably depends on how you feel about black being used as a uniform color for teams without black in their color scheme. They added all-black socks for a full-black look, minus the gold helmets. Here at Game Bibs, we’re all about rocking your team’s color scheme in full. To that end, the black is pretty jarring for us. We get it, there’s a bit of black in their logo and the color is intimidating, but true gold and red are a unique color combination in the NFL, so it’s a shame they didn’t try something with one of those colors instead. They could’ve added a red facemask to really up the color factor, too. As for the Cardinals, this design isn’t really a shift away from their standard road uniforms which made it seem like they were punting on the whole theme of the game. As jarring to the eyes as it might’ve been, a game featuring the Cardinals in all red and the Niners in all gold would’ve done better to keep in line with the theme of these games. 1.5 out of 5 stars for us. What do you think? Leave us a comment below!